I stopped by my hives on the way home today to see how things were going. And to check on my queens! 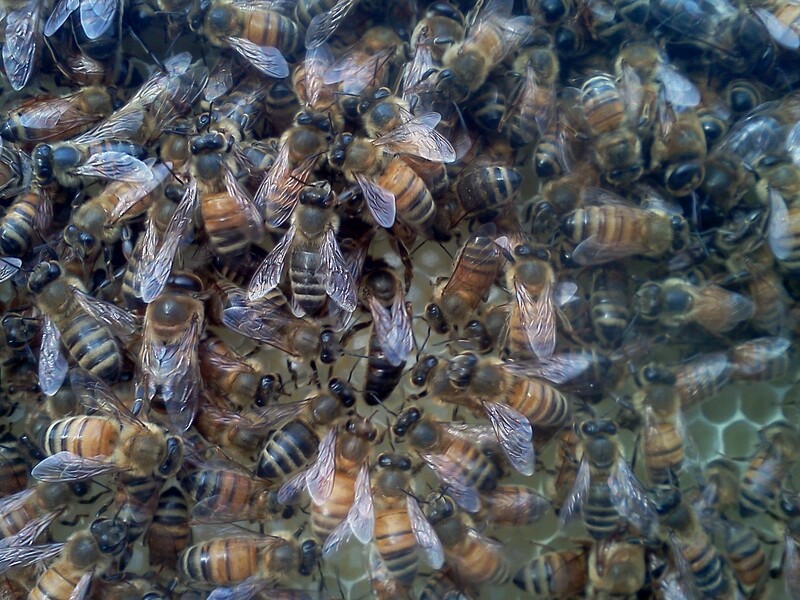 In a package of bees, the queen is kept separate from the "swarm" in her own cage with a few attendants. When installing a hive, the queen cage is dangled between two frames, the rest of the bees are poured over her, the cover is shut, and the rest is history. The worker bees outside tunnel their way into the cage by eating through a candy plug (literally, it's candy) and free her. But the beekeeper - meaning me - has to remove a little cork to expose the candy first. 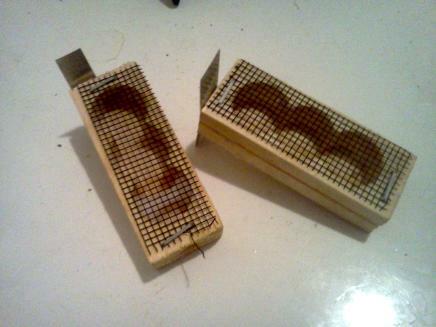 Well, in all my excitement this weekend, I seem to have forgotten to remove the cork in my third hive. 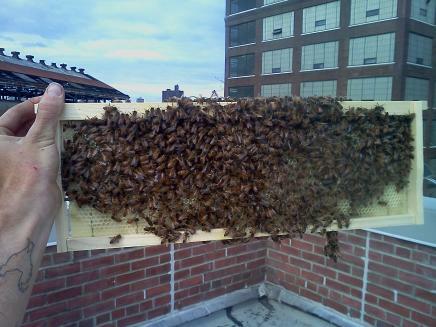 So today I quickly panicked, scraped it out with my hive tool, said a prayer, and stuck the cage back in the hive. Then I called Tim, who calmed me down. I imagined her in there, dying of thirst and hunger and needing to go to the bathroom just really badly, but Tim assured me that the bees wouldn't let her die so horrifically. Let's hope they're hungry and eat through that candy quick! So far, everything else looks great! 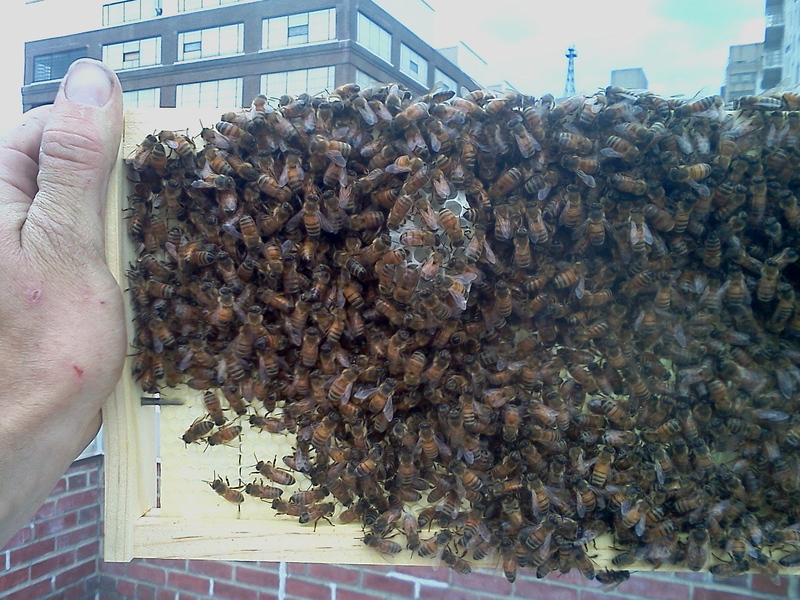 I was able to spot my other two queens, busily marathoning around the frames. They really are beautiful. 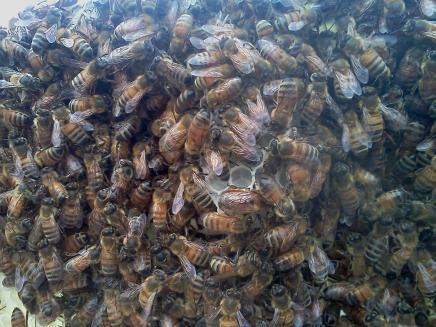 Especially her majesty from the hive that stung me. I think that hive is going to be a real winner. Out of all three, these ladies really got down to business. I couldn't believe how much comb had been built already, though I didn't notice any eggs. But I did notice a large "bump" of comb towards the upper corner of a frame. I'll need my fellow beekeepers to help me identify what's going on, but my first thought was supersedure... so early? Share your thoughts! I'll keep an eye on it, of course. Update: Turns out the comb bump is just extra that the girls drew in the relatively large space between frames propping up the queen cage. Thanks, Tim, for the diagnosis. So looks like no need to worry about supersedure or swarm... for now.